In the central place of the old city of Prague, Czech Republic, a child and a old man playing saxophone. Is the child so deeply in his own world that he can’t even hear the saxophone? Or is he listening to the saxophone so intensely that he does not let the noise around distract him from his concentration? 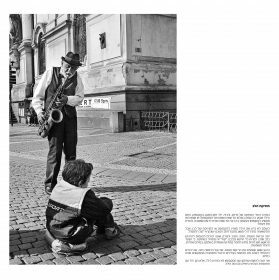 We shall never know if the child was listening to the saxophone or to the music of his heart, but the situation reminds me of a concept from Tibetan Buddhism called the “Voice of Silence”. This is the call for Truth, Beauty, Good and Just which we can sometimes feel in our heart, despite all the noise around us. This “voice” begins as a silence because the first step consist to being conscious of the lack of real music in our world : in other words, a lack of signification. Once we hear this emptiness, this voice of silence, we can begin to fill the silence with sounds and create the symphony with our actions in life. I want to believe that the old man with the saxophone was not disturbing the child, but was performing along with the invisible orchestra in the child’s heart.